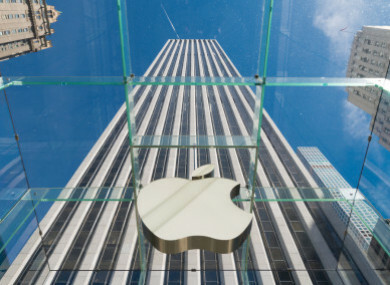 A SENIOR OFFICIAL from the Department of Finance has told the Public Accounts Committee (PAC) that it is close to reaching an agreement with Apple over the collection of €13 billion from the tech giant. The tax row dates back to 2013 when Apple’s chief executive Tim Cook told US lawmakers that the company paid an effective tax rate of less than 2% in Ireland. A year later the European Commission issued preliminary findings saying Apple’s tax arrangements were designed to give the company an improper financial advantage in exchange for jobs in Ireland. Last year the commission ordered Ireland to recover the funds, after it ruled that illegal aid had been provided to Apple over the course of a decade. However the assistant secretary at the Department of Finance, John Hogan, said today that an agreement has almost been reached with Apple. “We are working at the moment for the resolution of this and the infrastructure to be put in place in early 2018,” he said. The money is set to be placed in an escrow account which will manage the funds until a final ruling is issued on a legal challenge to the Commission’s ruling. A procurement process to appoint an escrow agent and a custodian to hold the assets and administer the fund is still ongoing. Hogan admitted that collecting the €13 billion is taking longer than anticipated. He said it required “a bespoke solution” because of the amount of money involved and the uniqueness of the case. The deadline for Ireland to recoup the unpaid tax, plus interest which could see the figure to around €15 billion, was January this year. In October the European Commission moved to refer Ireland to the European Court of Justice for failing to collect the taxes. “Until the illegal aid is recovered, the company in question continues to benefit from an illegal advantage, which is why recovery must happen as quickly as possible,” the commission said. The Department of Finance said it is “extremely disappointing” that the commission is taking the action against Ireland. Email “The government isn't saying when the €13 billion from Apple will be recovered ”. Feedback on “The government isn't saying when the €13 billion from Apple will be recovered ”.